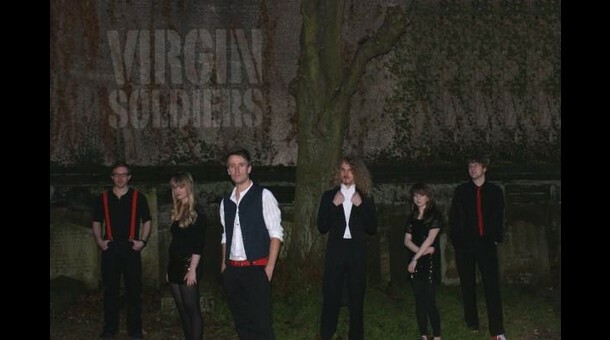 Bio: Kent based Virgin Soldiers is a group of talented young musicians who produce an exquisitely varied and unique sound. The band was formed in the summer of 2009 by James Beeny, a singer/songwriter who harboured ambitions to play contemporary music with classically trained musicians. James was soon joined by Charlie Andrew, who sings and plays the violin and Mike Parkin, who sings backing vocals and plays the violin, mandolin and bass. They were then joined by Tess Hardwick on cello, and Tom Gyr on bass,acoustic guitar and backing vocals. Finally John Hinchliffe joined the band and plays violin and piano. "Virgin Soldiers are a real find - their contemporary approach, coupled with great musical production creates a unique sound that is worthy of a national audience. It's rare to find such gifted musicians all working together to create such a memorable sound."